Hello Friends, after posting Shayari on Bewafa Dost, Good Night Shayari for Friends today I'm posting about shayari in Hindi for love. We have someone very precious in our life that we never wanna loose, and we can do whatever pleases that dearest someone. So this Shayari Collection is for those dearest people, to whom you love the most. Share these Romantic Shayari On Love to those lovely people of yours and let them know that they are very special for you. You can share them on Whatsapp, Facebook and Instagram or any other social media sites. Zakhm Itne Gahre Hai Izhaar Hya Kare. Hum Khud Nishana Ban Gaye Vaar Kya Kare. Mar Gaye Hum Magar Khuli Rahi Aankhe. Nafrat V Pyar Ki Buniyad Hoti Hai. Mulakat Se Achi Kisi Ki Yaad Hoti Hai. Risto Me Fashon Ka Wajud Nhi Hota. Magar Sagar Woh Bewafa Bahut Yaad Aati. I hope you enjoyed these Lovely Hindi Shayaris and shared with lovely people. 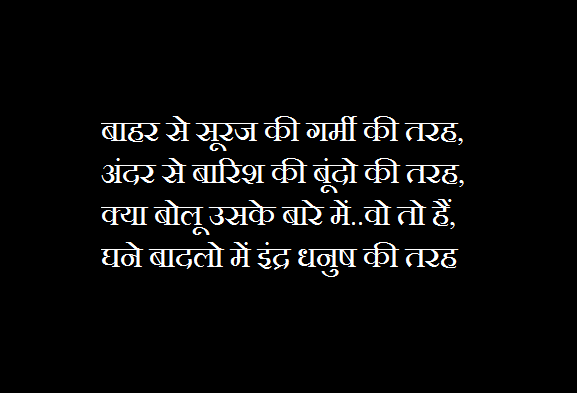 We'll be posting here more shayari collections, you can get the links from our homepage. And if you have similar shayaris them post them into our comment box and let our readers enjoy your shayaris too.